Originally I thought I would share the running post I’ve been working on today but I ultimately decided that I need a little more time. Expect that post tomorrow! So my weekend went by in a flash without me taking many pictures. It happens, right? It feels like it was just Friday afternoon and I was dropping my son at a friend! Time just flew by and I’m not even sure what I did that made it go so fast. I was in and out all weekend but when I was home, I made it a point to stay away from my laptop as much as possible. As a writer all week, it becomes challenging at times when I want to use my laptop for things like online shopping, personal social media or to research things separate from work. I need down time and that means limiting myself with my laptop for non-work things so that I can get a break from the screen. It’s hard even to classify my blog as work sometimes because I enjoy it so much. Writing here though plus writing all week for work can take a toll if I am not careful! Speaking of the blog, I mentioned last week that I am working on a blog redesign. I’m totally in that process now (!!) and finally scheduled myself a proper photo shoot (this week!) so that I have a nice selection of quality photos. Ironically enough, I was contacted minutes after scheduling the photo shoot for an interview for an upcoming article on runners and amenorrhea — they requested some hi-res photos too. This only reinforced how necessary the blog photo shoot really is for me! More to come on all of that going forward. In the meantime, here are some highlights from the weekend. Literally, some highlights. 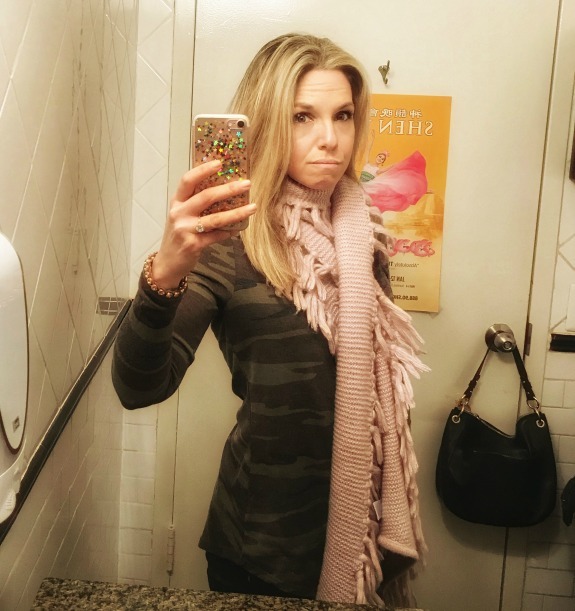 I was due for half a head of highlights (I try to go every 3 months) and did my usual salon bathroom selfie to ensure I was happy. ^I spy my favorite Soho Crossbody Hobo! If I’m limiting online shopping to stay away from the screen, you have to know I make sure to do real life shopping. I actually hadn’t properly been to the mall in quite some time. When I say properly, that means without my son. When he comes along, it’s a quick run in, run out situation. I spent some time at the mall with my mom and also ran into my friend Dina! 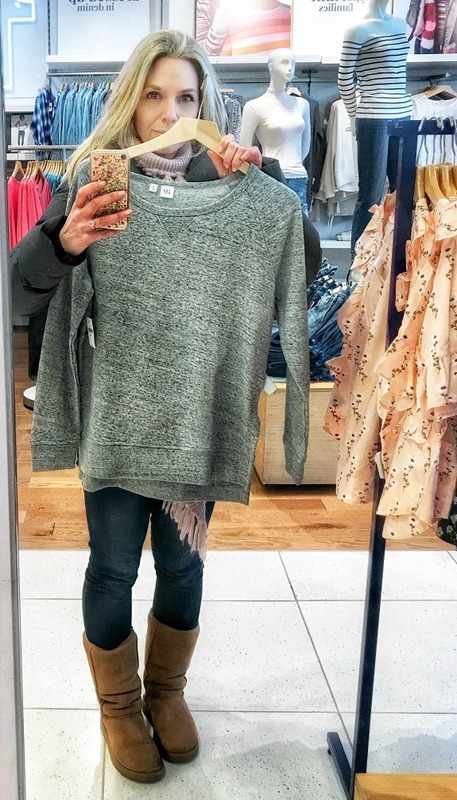 While in the Gap looking for socks, I found this soft, pullover raglan sweatshirt. Doesn’t it look rather big for the Extra Small? The Gap tends to run big but this is also why I like shopping in person. So many times you aren’t sure about sizing when you order online and then have to guess what will fit. Shopping in person lets you try things on and decide before making a purchase. A quick stop yesterday at Trader Joe’s because I didn’t buy enough the other afternoon when I thought I was making my full weekly shop. I’m really into this Veggies & Greens salad mix right now so I decided a few more bags would be good for lunch this week. I also bought the Southwest salad kit for my son because I thought maybe he would like it. 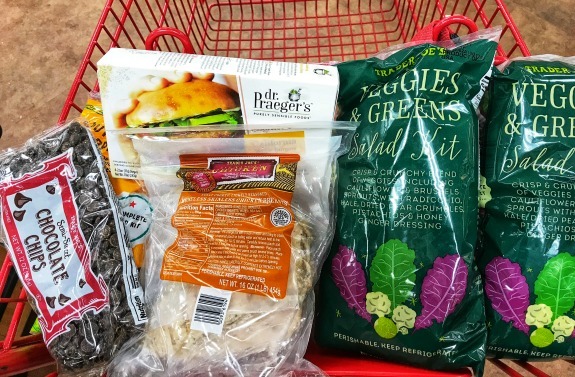 That bag next to the chocolate chips is a package of already cooked grilled chicken breasts. My son is impossible lately when it comes to me cooking chicken so I thought maybe he would eat this mixed into a salad or with pasta. Guess what?! He had it last night and really liked it! I realized that I could probably run outside this morning. Crazy concept, right? I can’t recall the last time I ran outdoors although it must have been at some time in December? A lot of the snow has melted, I don’t think there is ice on my path, and the temperature should be over 20 degrees. I guess if I want to bundle up, I can run a few miles out there rather than on the treadmill. How was your weekend? Do you try to limit your screen time to give yourself a break on the weekends? Have you ever bought this already cooked grilled chicken from Trader Joe’s? What do you think of it? Anyone else planning to run outside today? TJ’s has the best prepacked salad mixes. I have to limit myself from buying all of them when I go. On weekends, I find that I’m usually busy running errands or just hanging out around the apartment to really be on the computer. Plus not having to be on it all day for work really helps me. I’ll be outside today for my run! I planned on going this morning but then it felt like 4 degrees so I figured waiting until the afternoon so it would warm up a bit. I love shopping. I’m just not ready to go yet. I can’t wait to see the new pictures and blog design. I’m really good at putting my phone away for the night, fairly early. People know they can’t reach me and it gives me a nice break for sure! It took me forever to convince myself that professional photos were worth it. They totally are. I felt like a queen. You should wrangle hair and makeup too if you can. It’s a once in a lifetime thing! I need to get better about limiting my screen time. That’s so exciting about having headshots done and I cannot wait to see the new blog design. Today I ran outside – it was in the 40s when I ran! I end up on the computer alot on the weekends because its my time to work on blogging stuff. If I didnt draft posts on the weekends I don’t think I would ever be able to share posts during the week! But to me its more fun/relaxing than my screen time at work, but I still try to set aside just a few hours for it in the mornings. I think that maybe if I didn’t work from home, on my laptop the entire time, I wouldn’t mind being in front of it on the weekends. While I still do some work in the morning on weekends, I do try to really limit it to save myself for the week. A blog design sounds super exciting! I can’t wait to see it. I’ve been thinking about one myself, but not quite ready to tackle that beast. And I definitely try to limit my time in front of the screen when I’m not working… otherwise I feel like I’d never walk away from the computer. I remember you have talked about a redesign for a while, I think we both should do it now! It’s such a process but in the end it becomes worth it.